By now readers will have heard of the "bomb plot" uncovered by the Interior Ministry (with dramatic video) and now being investigated with the help of a forensic team from the British Metropolitan Police. (It seems that Yates' advisory role with the Interior Ministry did not end as scheduled in April after all.) Three individuals have already been named as suspects, and anonymous "senior political officials" have told the BBC that the devices are so sophisticated that they "could not have been put together without help from outside the country"--namely from Hizballah, with whom the three suspects are purported to have trained. The "bombs...with hundreds of iron balls" sound like a standard AP device, in which (steel) ball-bearings are laid over the explosive charge to function as shrapnel. The set up has been used in suicide vests, in improvised hand-grenades, and in "claymore" type devices, whether improvised or manufactured. Such a system in itself is not indicative of any particular geographic or organisational origin. One will observe further that the original report in the Gulf Daily News of "five tonnes of explosive materials" has since been downgraded (in the BBC story linked above) to "over 100kg," a difference of merely 1.5 orders of magnitude (~45 times). So more or less the same. Yet, media exaggerations aside, the more general difficulty in knowing what to make of Bahrain's newest foiled terrorist plot is that the country may well be the historical origin behind Aesop's "The Boy Who Cried Wolf." (Which would vindicate Sunni claims of being the original inhabitants of the island!) When every activity of the unregistered opposition or trip to Lebanon by someone linked to Shi'a groups--to say nothing of the February uprising--is a new terrorist scheme, who can blame observers for being skeptical when the Interior Ministry insists, "No, srsly, this time it's a real plot we even have a video LOL! !1"
On the other hand, could one really be surprised if after 18 months of political stalemate and little hope for a breakthrough individuals would begin to turn to more radical alternatives in order to get the state's attention? 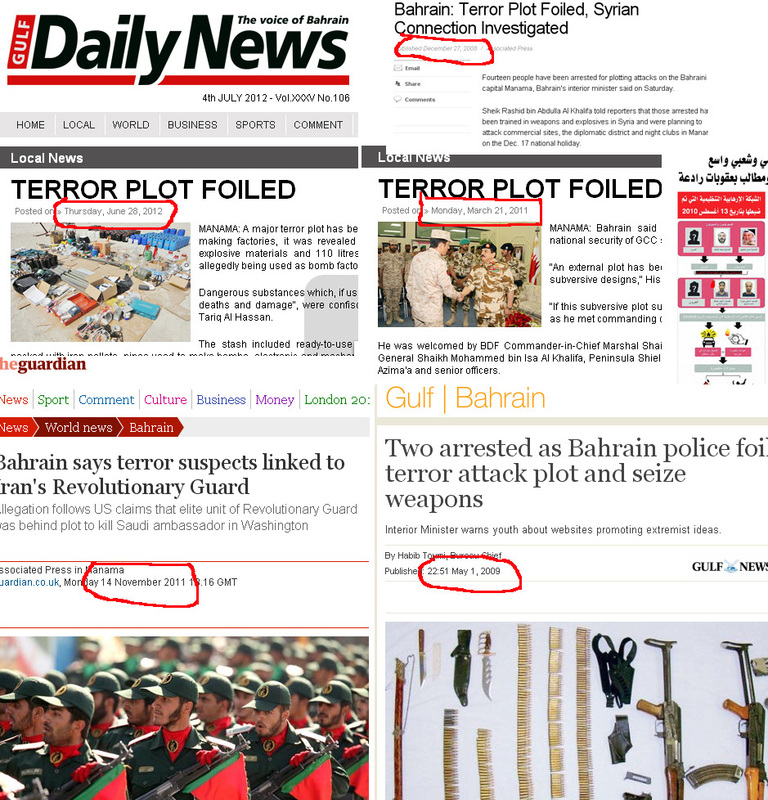 Indeed, already in April 2011 Hussein Ibish wrote a Foreign Policy article asking, "Is Bahrain Creating a New Terrorist Threat?" 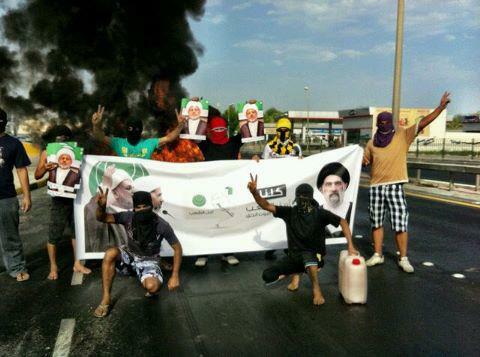 Since then, few in Bahrain have escaped involvement in the turmoil either directly or indirectly via family and friends. At the same time, Bahrain's political factions have undergone marked polarization, with many in the opposition oriented not only against the government, but also against the state's Sunni and Western supporters. On the other hand, Sunni movements continue to decry the Iranian-backed opposition as well as Western (i.e., British and especially U.S.) meddling, and this has been actively encouraged by none other than ranking government officials such as Defense Minister Khalifa bin Ahmad. "My blood is at your command, Sh. 'Ali Salman." "Muhammad Al Mahmud: WANTED: alive not dead"
The main question for the Metropolitan Police, then, will be not simply who is behind the alleged plot, but at whom it was aimed. Given the recent escalation in anti-Western rhetoric, one wouldn't be surprised to find that its target was not the regime in Bahrain but some other government. When 'Ali Salman says [see here for background], "We didn't use 50% of our power," is this the peacefulness he alleges and that the state believes? This is a clear threat of terrorism and the use of violence, and it's not the first. So with whom are they dialoguing? We all know what he wants Bahrain to become, and we all know the plan called the terrorism of February 14th, which is the seizure of the entire Bahraini state. And perhaps ['Ali Salman] will do with the people of Bahrain what Bashar is doing to his people, as they are of the same thinking and of the same sectarian tendencies. We all know the plan, but we lie to ourselves and say "dialogue." And we say a lot of things, but we know within ourselves that the question isn't of "reform," or of "democracy," but of an obsessive, exclusionary sectarian project. To our dear brothers in the Ministry of Justice, [the minister of justice] said a while back that there will be accountability for and control over any provocative voice coming from the pulpit, and certainly this statement came after the king's talk before the Council of Ministers. But allow us brothers in the Ministry of Justice, and allow us Mr. Minister, Minister of Justice, [to say] that what we see and what we are witnessing is not the case. Talk in the press is one thing, and practice is something else. Stop all the voices of incitement from any party whatsoever--this is what we ask, to apply the law to everyone. But your ministry [has] applied [it] in one direction only, and is unable to apply the law to others, and this is disaster. Give us one example, Ministry of Justice, of any arrest [of] the instigators at the pulpits? Or do you even to this day still not hear [their] voices?" Update: The Metropolitan Police have released the following photo of the suspected terrorist plotters. Can you help identify these individuals? Please write in! Relax Justin. You should know that Eastern cultures, particulary the Arabs, are more talk than action. Full of bravado and machoisms but very little substance to back it up. Think Saddam (here again - big moustache was very important), Gaddafi, Bin Ladin, bla bla bla. No different here is the opposition and government, they are equally full of crap, they over state and threaten and under deliver no matter if you are a fan of either. Its a general rule that applies throughout the wretched Middle East and beyond eastwards. 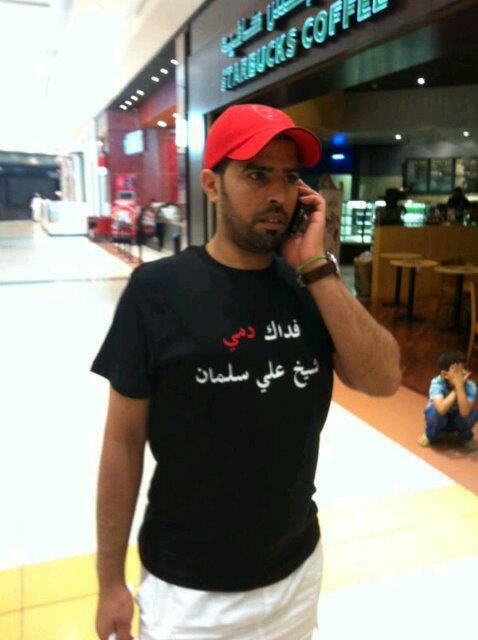 Why is it that the average Bahraini succumbs to less calories than his GCC bretheren! Thats just not fair, I want my double cheeseburger too!! @Sal: I see you're posting again and not just lurking. Actually it looks like you are around the 40th percentile in the GCC, with only Qatar, Kuwait, and the UAE ahead of you. So the real question is what are the Saudis and Omanis eating? A Sectarian Ramadan Kareem to You!